Receive $3000.00 Conquest cash towards the lease or purchase of a new, unused 2019 Audi A6, A7, A8, Q7 or Q8 model. Welcome to Audi Rochester, Rochester's leading dealer of new and used Audi vehicles! Our number one priority is to provide unmatched service and unbeatable value to all our customers. So if you're looking to buy a new Audi near Rochester, come on by for a test drive today! We are proud to serve the Henrietta NY, Pittsford, NY, Webster NY & North Greece NY regions and the counties. It goes without saying that Audi is synonymous with luxury, high-performance vehicles. This means that no matter which Audi model you choose -- the class-leading new Audi R8, the stylish and mind-blowingly fast Audi TT Coupe or the classy, sleek Audi S5 -- you'll discover real truth in engineering. We encourage you to explore our complete inventory of new Audi cars in Rochester NY, which spans the new Audi A7, A3, A4, Q5, A8, S8, A6, and all new Audi Q3 models. Cruise on over to our new vehicle showroom to see additional details and specs for new 2018-2019 Audi cars. Can't find the exact model you're looking for? Use CarFinder to request personalized service. Simply enter the details of your preferred Audi: model, color, options package, etc. Then, when that particular vehicle arrives at our Audi dealership, we'll notify you immediately so you can come by for a no obligation test drive. We can even arrange to have your new Audi delivered to your home or business! Audi Rochester is also a leading Rochester-area dealer of used luxury cars and SUVs and Certified Used Audi Cars. View our Audi specials. So regardless of whether you're looking to buy a new or used Audi car, our friendly Audi sales team is standing by to serve you. Our customer focused philosophy has made us the Audi dealer of choice for drivers from Henrietta, NY, Pittsford, NY, Webster, NY, North Greece, NY and beyond, and we hope you'll consider us for your next Audi lease or purchase. To learn more about Audi leasing and other financing options, please visit our Audi lease & car loan center in Rochester, NY. We're committed to helping all our customers find attractive financing options, whether that means an Audi special lease, an attractive Audi financing rate or other offer. We list all our finance specials online. And don't forget that you can apply for financing quickly and easily using our secure online Audi finance application. As a leading Rochester, New York Audi dealer, we have a commitment to excellence that extends far beyond the final sale. Our team of expert Audi service technicians, for example, remains dedicated to the health of your Audi for as long as you own your vehicle. Whether you need regular maintenance or more serious car repairs, you can count on our Audi Service & Repair Center to address your vehicle-related needs in a prompt and professional manner. Need to schedule service? You can do so quickly and easily using our online appointment form. We also carry a good selection of genuine Audi Parts, which means that we typically have everything we need in stock to make the needed repairs. If not, we'll order the car part you need and get you quickly on your way. And if you've been in an accident or your Audi car has suffered some kind of body damage, visit our Rochester, NY, auto body shop and collision center professionals at Audi Rochester to get your vehicle back into shape. Get all the information you need about Audi Winter Packages to safely enjoy the snowy season! Again, we remain dedicated to ensuring that you receive prompt, high-quality service every time you visit us. And since our main Audi dealer showroom is located at 3955 West Henrietta Road, Rochester, NY. Whether you live in Henrietta, NY, Pittsford, NY, Webster, NY or North Greece, NY, we hope you'll visit us soon. 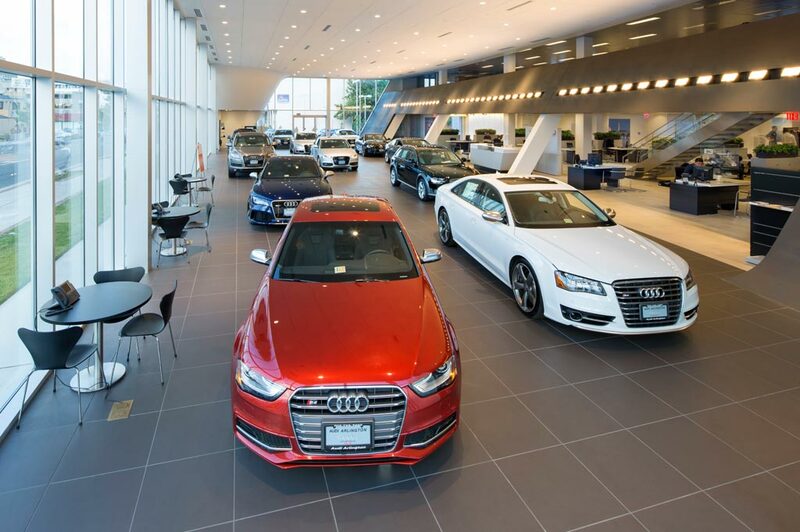 Audi Rochester in Rochester, NY treats the needs of each individual customer with paramount concern. We know that you have high expectations, and as a car dealer we enjoy the challenge of meeting and exceeding those standards each and every time. Allow us to demonstrate our commitment to excellence! Our experienced sales staff is eager to share its knowledge and enthusiasm with you. We encourage you to browse our online inventory, schedule a test drive and investigate financing options. You can also request more information about a vehicle using our online form or by calling 585-334-1600.